Computed Tomography (CT) offers an innovative way for physicians to obtain the information they need to diagnose disease and life threatening illness, including cardiovascular disease, stroke and chest pain. Our newest GE Revolution CT Scanner captures images of the heart in a single heartbeat, and other organs in only a second, turning them into 3-D views that doctors can use to decide the best course of treatment. 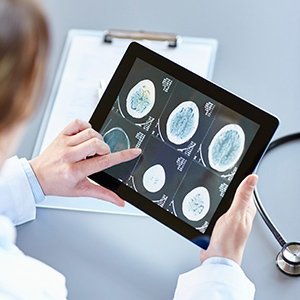 With faster, more accurate scanning techniques, physicians are able to view clearer, sharper images, thus allowing them to review the case within five to ten minutes and make an accurate diagnosis. The GE Revolution scanner ushers in the next generation of CT imaging by offering low dose, game-changing clinical applications in neurology, cardiology and trauma. The Revolution scanner creates high-resolution anatomical images that form a three-dimensional view of a patient’s anatomy, breaking barriers in speed and accuracy in diagnostic capabilities. The newest scanner available can be used for a variety of procedures, including cancer care, stroke workup, and kidney and liver exams, but the Revolution CT is most beneficial for the field of cardiac imaging. This new technology can capture images of the entire heart in a single heartbeat, along with the ability to decipher between aortic dissection, pulmonary embolism, and coronary artery disease, the three major causes of mortality in patients with chest pain. In addition to the new diagnostic power in cardiac cases, the Revolution offers the speed and resolution needed for immediate imaging of blood vessels following a stroke. GE’s new Revolution CT is built with a 256-channel design, which increases the high-resolution volume coverage incredibly when compared to the traditional 16-64 slice detector. The slices produced by the Revolution scanner can be as small as .3 millimeters thick, and the key to a successful diagnosis is to make the slices as thin as possible in order to achieve the highest resolution. Visit the GE Revolution Website. Department of Radiology, 2nd Floor, Room 236. Do not eat or drink anything except water for 4-6 hours before your exam because it could interfere with the results; do not even chew gum. If you take medications, drink only enough plain water to swallow them. If you have been advised not to take your medications on an empty stomach, eat nothing more than a few soda crackers within 4-6 hours of your exam. If you feel feverish, please call this to our attention. In addition, please let us know if you might be pregnant or are currently breast feeding. You should allow 2 to 3 hours for the entire visit. When you arrive, we will take a review of your history and any past exams. Depending on the exam, you may be required to drink an oral contrast. For most studies, you will have to wait for the contrast to distribute itself – typically one hour. During this time you will be asked to relax. LightSpeed SeriesYou will lie on a comfortable padded table. The table will move slowly through the tube-shaped VCT scanner as it acquires the information needed to generate diagnostic images. You will be asked to lie very still during the scan because movement can interfere with the results. You will be asked to breath normally during the scan. During the scan, you might hear a humming noise but you will not feel anything unusual. You may feel the table move while images are being taken at certain locations on your body. Our technologist will monitor you during the exam. The specific details of your upcoming exam will be explained fully by our technologist or your physician. The VCT scan should last between 30 and 45 minutes. The exam procedure can vary depending on what we are looking for. Plan to spend two to three hours with us. You may leave us as soon as the exam is complete. Unless you have received special instructions, you will be able to eat and drink immediately – drinking lots of fluids soon after the exam will help remove any of the contrast that may still be in your system. In the meantime, we will begin preparing the results for review by our diagnosticians, and then by your physician, who will tell you what we have learned. Be assured that VCT exams are a safe and effective diagnostic procedure. If a radiopharmaceutical contrast is used, it will not remain in your system long, so there is no reason to avoid interacting with other people once you have left.